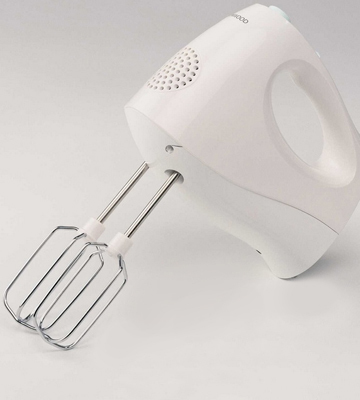 It is a lightweight, ergonomic hand mixer with a powerful but very quiet motor. It has 5 speed settings and a turbo function to provide you with excellent results within a short period of time. The beaters area is somewhat small. Designed by Bosch, this hand mixer has a lot of advantages over its rivals, making it a solid choice both for beginners and professional chefs. It costs more, but it offers more too compared to many similar models. Smart Storage Case is a convenient option for storing all attachments as well as a power cord in one place. With such a useful addition, you won't lose anything. 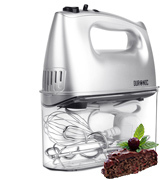 The Duronic HM4 is a high-quality, reliable and simple mixer that has a powerful motor and a heavy-duty stainless steel body. In addition to the full kit of attachments this mixer stands out with its great ergonomics and rather compact size. It is a lightweight mixer with a powerful motor, 5 speed operations, Turbo Function and Ejection Button for easy, fast and convenient use. Five different attachments will make your cooking much easier than it used to be and will bring diversity to your dishes. The release mechanism for mixing paddles is a bit stiff. A nice choice for those who want to have a functional and reliable hand mixer for everyday cooking or baking. The improved cooling system won't let the motor overheat even after long mixing, which makes the use of this mixer as safe as possible. And the folding construction of the attachments implies an ergonomic storage of the device. 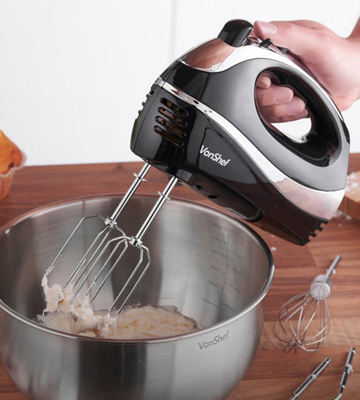 The Kenwood HM220 is a practical hand mixer that will become a worthy purchase for a small family. The device is easy to use thanks to the moulded handle that absorbs extra vibrations. 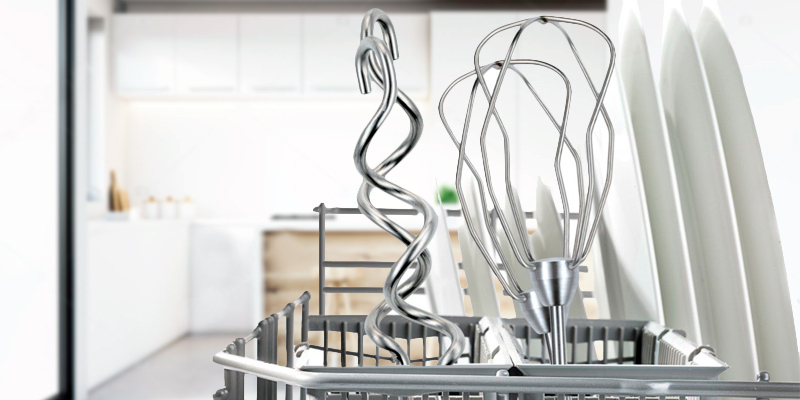 The ability to clean whisks in a dishwasher simplifies the maintenance. The hand mixer itself is very powerful yet quiet. It is easy to store since it is very compact and has a handy cable compartment. Moreover, there are replaceable parts to prolong its life. The cord is rather short. If you don’t feel like overloading your kitchen with lots of appliances, then choose this compact 3-in-1 Dualit 89300 Hand Mixer to save your time and money on food preparation. As we all know, handheld mixers are usually cheaper than stand mixers. Besides, they take less space in the kitchen and can become your best companion in cooking or baking. 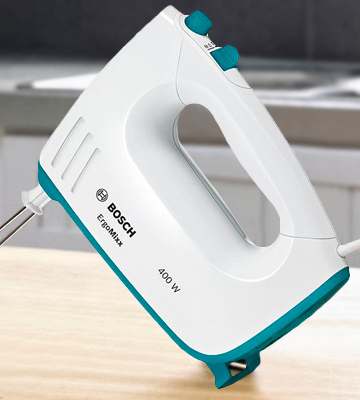 If you are looking for a high-quality hand mixer, check out the Bosch MFQ36300GB. 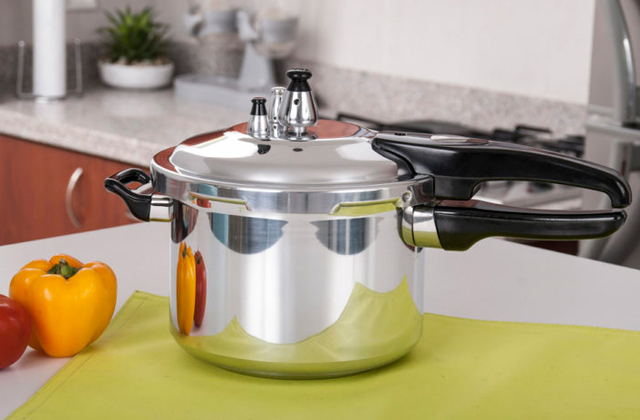 Cooking with this mixer can be not only simple but also enjoyable since it has an ergonomically-shaped handle to fit in your hand perfectly, as well as large and simple-to-use buttons. This all contributes to the convenience of use. With its light weight that has been reduced due to the latest motor and materials, you will forget about hands fatigue and soreness. 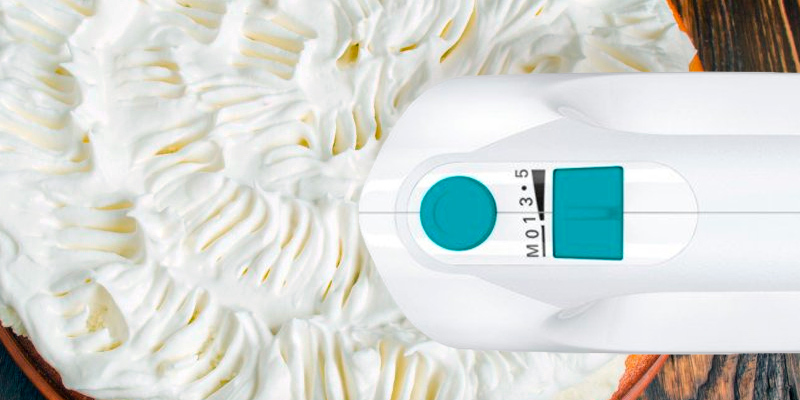 Thanks to its powerful 400-Watt motor, it won’t be a problem to whip cream or knead dough in a short time. Moreover, the unit offers five speed settings to help you choose the most appropriate one for the ingredients you're going to mix. 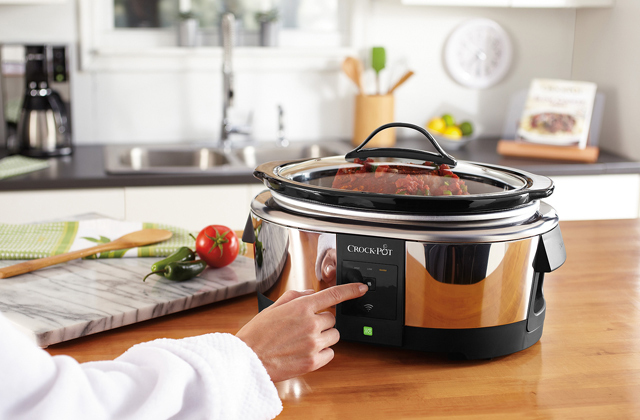 Also, it has a turbo function that speeds up the cooking process significantly. Along with the powerful motor, this mixer is equipped with two turbo beaters to provide quick whisking of eggs and beating of cream. 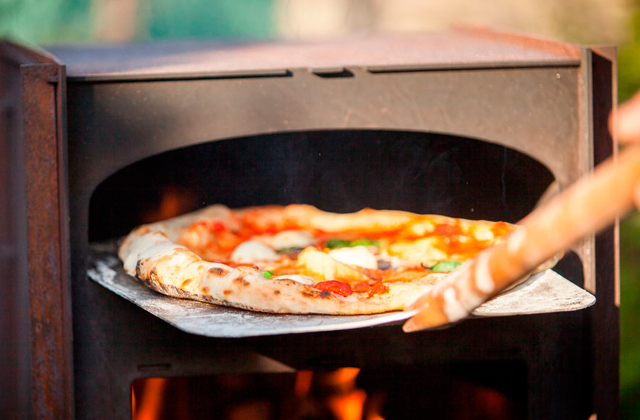 It also has two kneading hooks for creating a smooth dough. All attachments are made of high-quality stainless steel and show reliable performance. You can easily switch between the attachments at a click of a button. 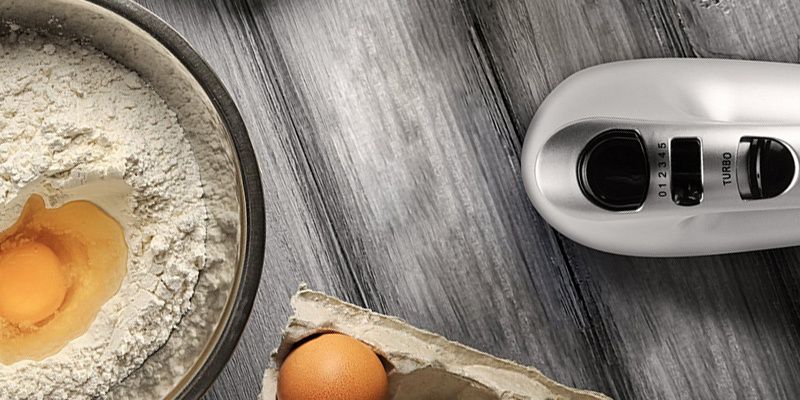 There are a few more features you will probably like about the Bosch MFQ36300GB Hand Mixer. For example, all of its accessories are easy to clean after use. You can put them into a dishwasher or clean with warm water and soap by hands. As for the main unit, just wipe it with a damp cloth and stow it away in a drawer. Another thing we like about this mixer is that it has a special groove for the cord, which helps prevent it from damaging during storage. Finally, you should be pleased with its noise reduction system. Designed based on the latest technology, the operation of the mixer has become quieter than usual and less annoying. 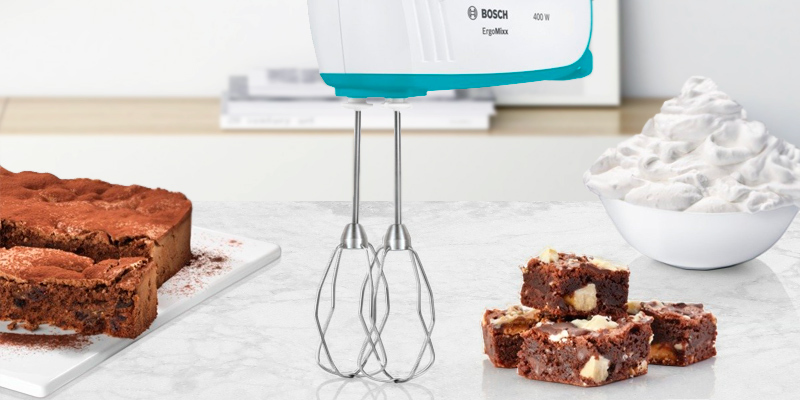 So, if excellent performance and quiet operation are the things you need in your hand mixer most, the Bosch MFQ36300GB can be your best choice. 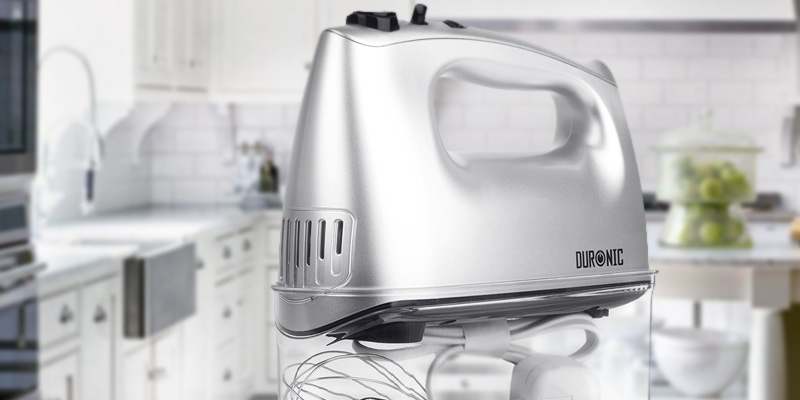 If you are in search of a hand mixer that will be high-quality, powerful, and convenient to use, the Duronic HM4 is the one that should fit you to a tee, covering most of your cooking needs. Equipped with a 400-Watt motor, this mixer is able to mix both wet and dry ingredients quickly and efficiently and do this without creating any mess. Despite delivering fast operation, the overheating of the motor is excluded thanks to the vents and built-in fans that cool the mixer during work. Another benefit of the Duronic HM4 is that, while it seems big, it's actually lightweight and thus can be easily moved without tiring your wrist. The mixer is very easy to use and doesn't have any intricacies to get the hang of. All controls are intuitive and placed comfortably on the handle so you can easily reach them. 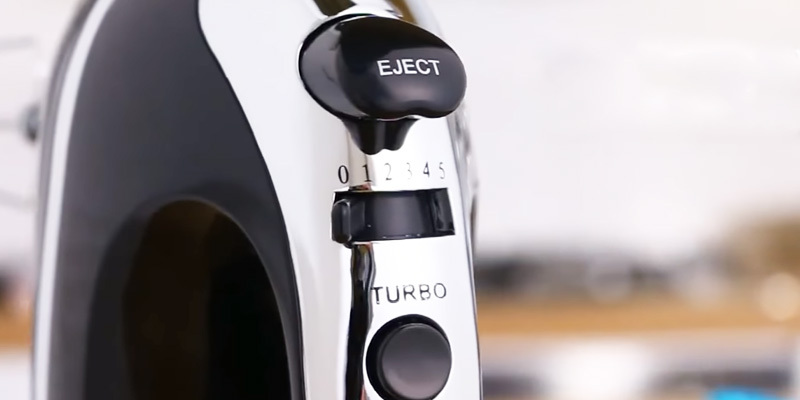 Along with five speed controls, there's also a Turbo button which will let you do mixing fast and effectively. On top of the variety of speed settings, the mixer offers you the benefit of several attachments that come boxed with the purchase. This makes it fit for a variety of mixing jobs. 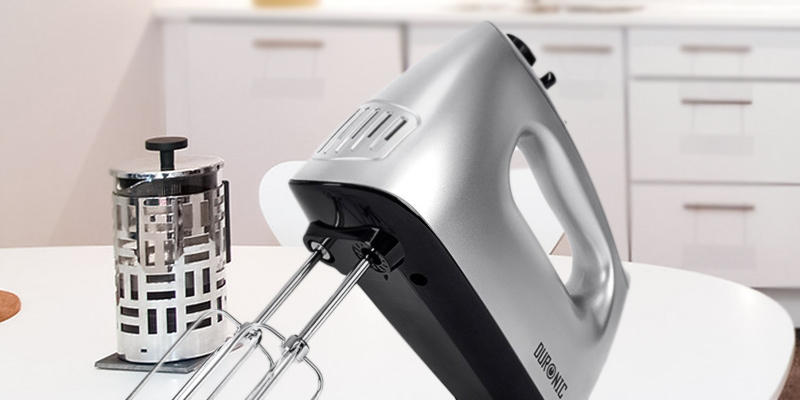 While the Duronic HM4 hand mixer can offer you many advantages, one thing that we like about it in particular (aside from its performance, of course) is its design. The unit has a beautiful silver body which may become a good match with just about every kitchen interior. Furthermore, it has a small footprint, requiring very little space on a countertop. Plus, it has a convenient storage case in which you can store the mixer as well as other accessories that you receive on a purchase. This helps minimize the risk of losing something. All attachments that you get are detachable, which is also helpful, and can be safely washed in a dishwasher or by hand if you wish. As we've mentioned, the Duronic HM4 comes with several additional attachments. They are suitable for mixing soft and heavy mixtures. The beaters are used for mixing wet and heavy mixtures such as biscuits, cookies, and all kinds of pastries. 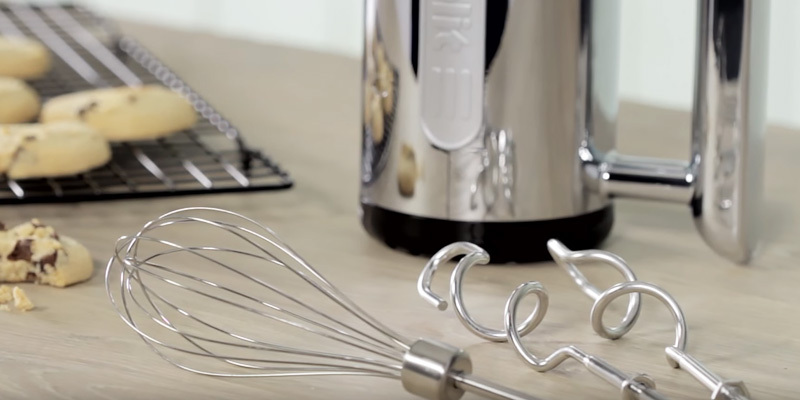 Metal whisks are more suitable for mixing such ingredients as egg whites, cream, and icing. All these attachments come included in the package. 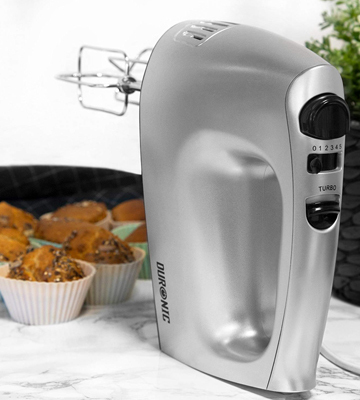 For those who love home-made pastry and seek a mixer that will allow them to experiment with recipes while slashing the time needed for cooking, the Duronic HM4 will fit the bill. 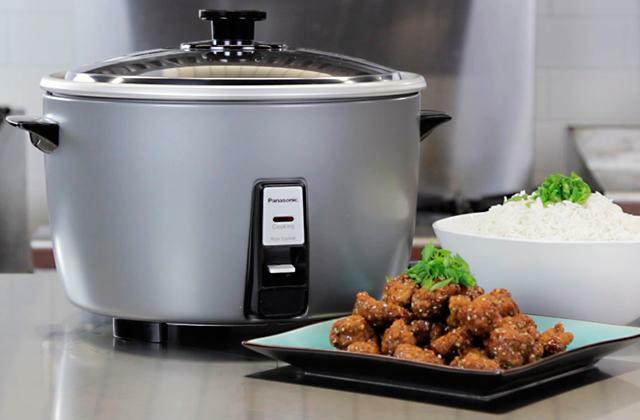 It includes five settings, has all the needed attachments on it, comes with a few bowls, and, unlike many other models, is very portable, not taking up a lot of kitchen space. Perfect combination! Hand mixers are very practical and handy kitchen tools. They are good for mixing, baking and cooking needs. If you have a tight budget but feel the need in such appliance, it is possible to buy a reliable and at the same time durable hand mixer for less than $50. There is usually no need to purchase something more expensive unless you are a professional baker who cooks a lot and very often. So, when it comes to affordable price, convenience, and durability, the 07/067 hand mixer by VonShef is exactly what you need. It will make you love cooking and baking even if you've never enjoyed it before. 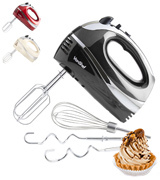 This model comes with an excellent 300-Watt motor and a turbo setting that are sufficient enough to mix, whisk, and knead without any efforts. With 5 speed levels, it became easy to achieve desired results in whisking or mixing since you can select the mixing speed to fit the chosen ingredient best. For instance, the fifth level would be great for whipping cream and eggs, whereas the first, slowest speed would suit stirring and mashing fruit or vegetables. 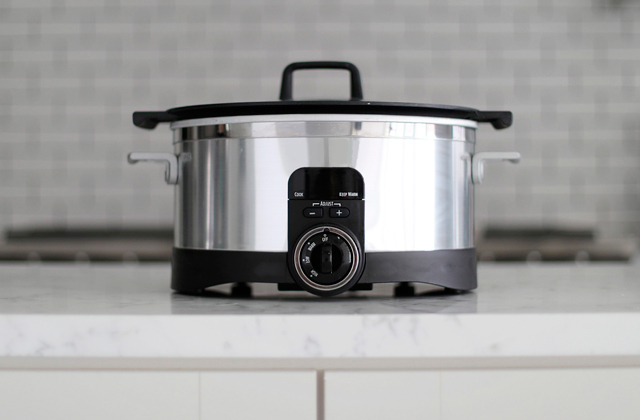 If you use one of the five settings with a turbo you can adjust the power to cooking everything from the lightest soufflés to the toughest dough mixtures. 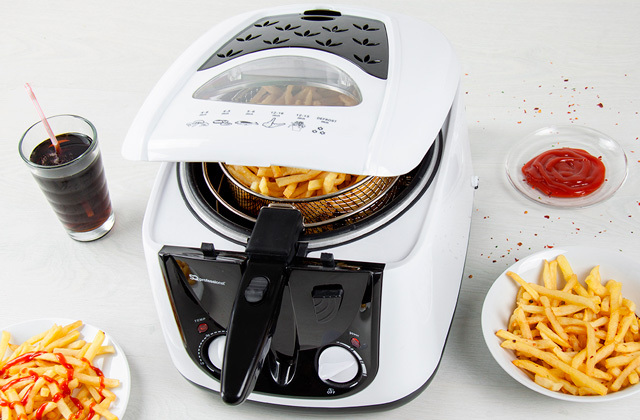 With this appliance, your creativity will know no limits. 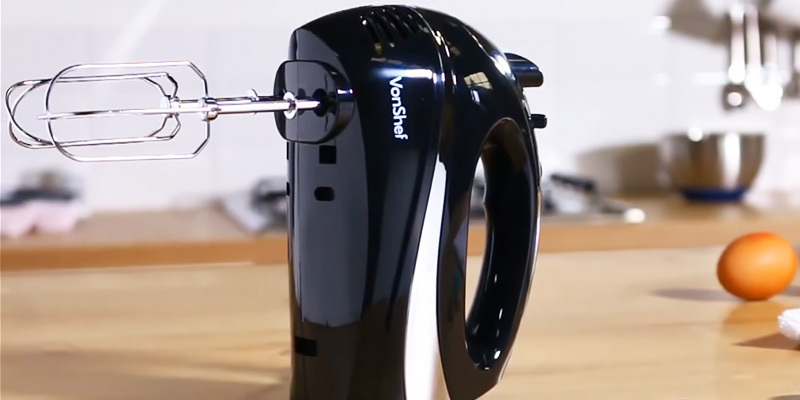 The VonShef Hand Mixer will add a variety of dishes to your everyday diet as it is equipped with 3 attachments to help you master different cooking techniques with little effort. There are two durable chrome dough hooks to make the preparation of dough faster and more thorough. Plus, there are two chrome beaters and one balloon whisk for whisking and creaming components with just one press of a button. 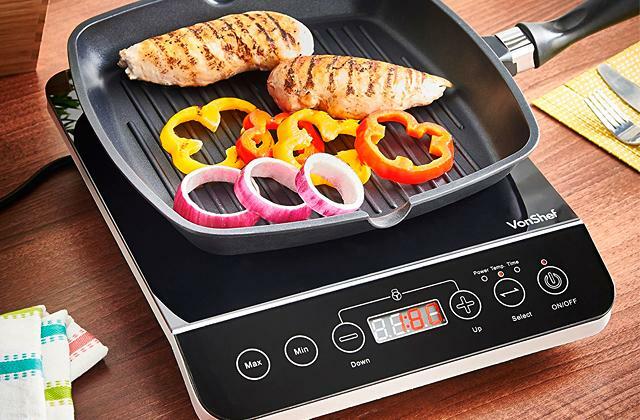 Cooking has never been so easy. The VonShef 07/067 Hand Mixer performs a great job, whereas its outstanding black and silver design makes it look modern and stylish. 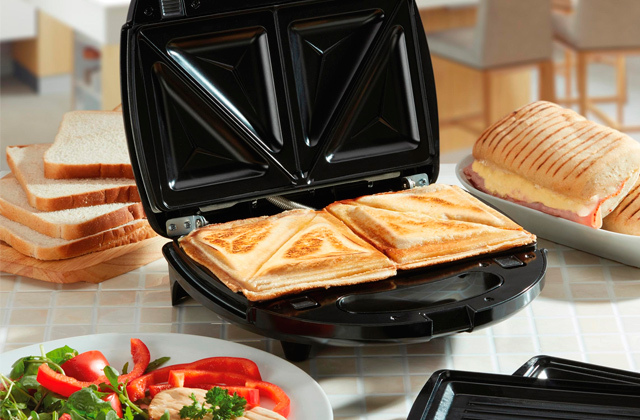 Being light and compact it will be able to save precious space in your kitchen. You can easily store it either in a deep drawer or in a cupboard. 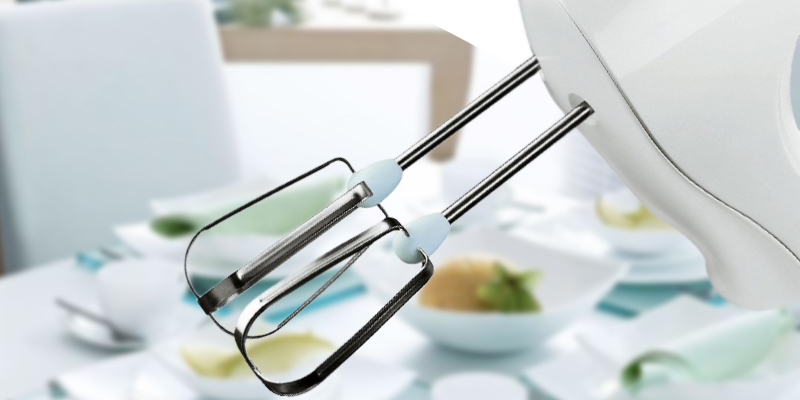 In addition, all components of the hand mixer are dishwasher-safe and easy to clean. Therefore, you will need less time for washing up, freeing some for baking. The Kenwood HM220 is a budget-friendly yet reliable mixer that will be able to deal with any mixing job you throw at it. Although it doesn't have the most powerful motor (150-W), it benefits from the improved cooling system that prevents it from overheating thus extending its operation time. We wouldn't recommend using the Kenwood HM220 for mixing tons of mixtures, but it will certainly suffice for basic tasks. It's designed mainly for small families with average mixing needs. 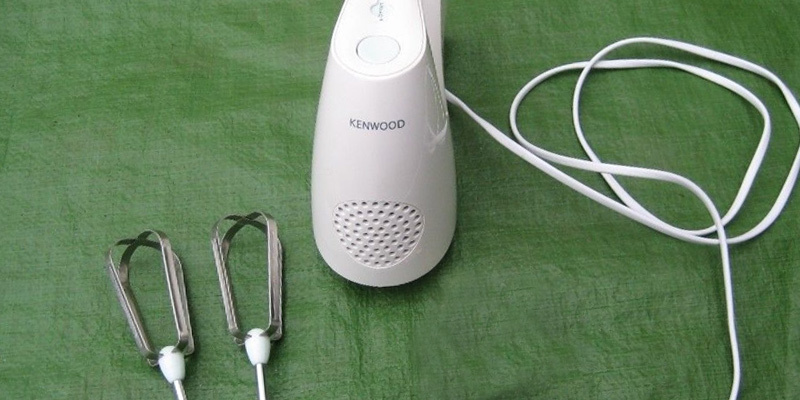 Speaking of the design, the Kenwood HM220 looks like the majority of other hand mixers. Enclosed in white plastic housing, it looks elegant and will match perfectly with your other kitchenware. 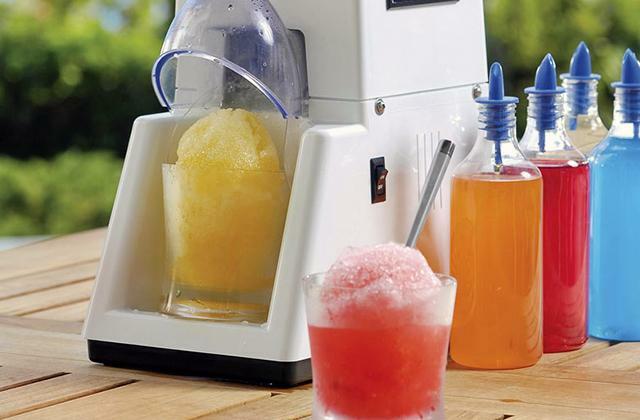 The mixer isn't big in size and convenient to stow away due to its special folding construction of the attachments and wraparound cable storage. You will be able to hide it away on a shelf or in a kitchen drawer. 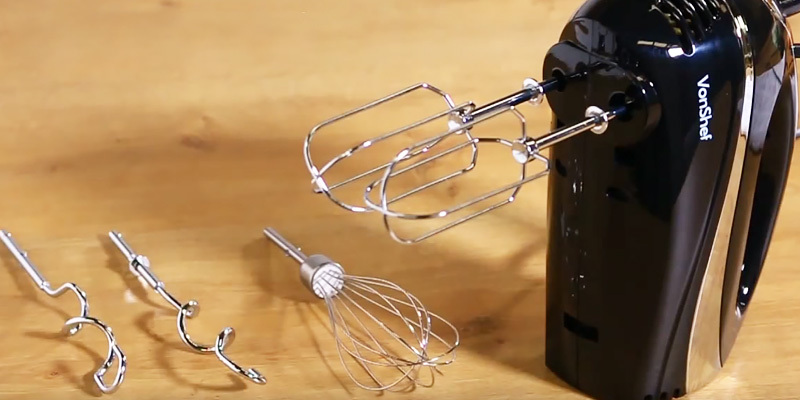 Despite rather low power, the Kenwood HM220 hand mixer is fit for many jobs. Apart from baking, it will come in handy when cooking other dishes like desserts, bread, dough, smoothies, etc. It comes with three speed levels, allowing you to increase/decrease the speed so you can achieve the needed mixture consistency with little effort. 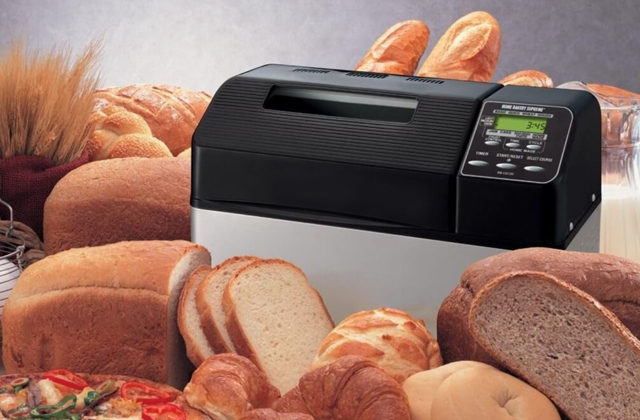 The Kenwood HM220 packs a standard set of attachments, including special beaters for kneading dough. Granted you have a bread maker, baking home-made bread will take you sheer minutes. 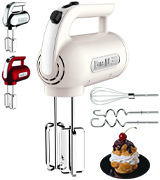 For preparing creamy mixtures such as mouses and cheesecakes, the Kenwood HM220 offers the whisking option. This option will also be good for making various kinds of sauces. Cooking spongy and airy omelettes will also become much easier as beating eggs will never take you longer than one minute. The controls of the mixer are all intuitive and situated conveniently on the handle so you can easily push them when holding it over a mixing bowl. As we've mentioned before, the Kenwood HM220 hand mixer has a well-thought-out cooling system, which makes it safe to use for a long time. Though we would advise against using it that long, its motor is powerful enough to run continuously without stopping. Finally, we'd like to say a few words about the maintenance of the mixer. 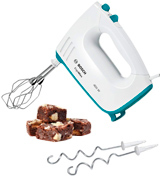 Like with any other mixer, you won't need to put a lot of effort in keeping the Kenwood HM220 clean. The plastic body is enough to wipe with a cloth and its stainless steel blades and beaters can be just thrown into a dishwasher. In conclusion, if you want to diversify your daily menu and consider purchasing a mixer for that, the Kenwood HM220 might be a good option. It isn't as bulky as stand mixers, yet it has enough power to cope with most basic mixing jobs. One of the best solutions for those who need an inexpensive hand mixer. The Dualit 89300 HandMixer is a godsend for aspiring chefs, designed to become your hard-working assistant. 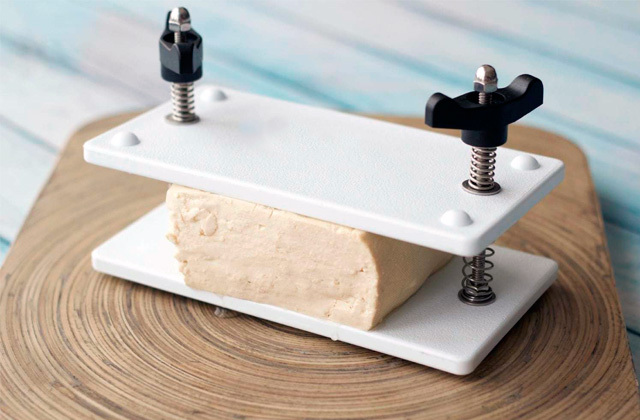 This nice tool with sleek, classic design will easily fit in the smallest place in your kitchen due to its compact size and weight of just 2.8 pounds. To add to that, it has integral plug storage along with a retractable cord to minimize clutter. Though compact and portable, the Dualit 89300 is quite powerful. It is equipped with a 400-Watt motor and 4 speed levels ideal for whisking cream, egg whites, mixing cake batter, or kneading a dough. Basically, it will be able to take any challenge in a matter of moments when used with the right attachment. It comes with 3 accessories: flat beaters, dough hooks, and a balloon whisk. They will help you accomplish different tasks and get desired results. 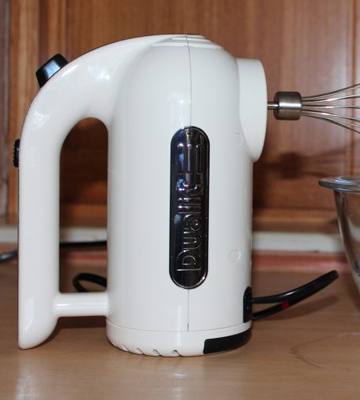 Even though the Dualit 89300 Hand Mixer is built to last, the wear and tear may take the toll. For this very reason, the kit includes replaceable parts that will increase the lifespan of the machine allowing you to enjoy it for many years. At the same time, its strong and very comfortable grip handle will let you have a great control over the mixer. 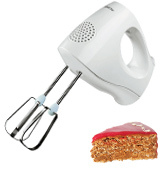 Finally, the hand mixer boasts a beater ejection button that allows easily swap and clean the accessories after using. When you finally get your Dualit 89300 Hand Mixer, make sure that you know how to use it correctly to avoid damaging it. There are several simple tips we’ve selected for you to help with that. Before you begin, we recommend you to read the manual where you will find some useful information on exploitation and on how to fix unexpected breakdowns by yourself saving you a trip to the service centre. Secondly, learn how to match the attachment to the ingredient for the best result. Next, don’t jump abruptly from one speed to another if you want to get the right consistency. Finally, always keep your mixer clean after use but avoid getting water inside the chords and buttons as it can render your mixer useless. The Dualit company has more than 70 decades of baking experience and is aimed at creating know-how and quality products for the customers. Their quality policy makes them one of the most-trusted companies with sturdy products that are high on performance and last longer. Buying their products, you make a good investment of your money. A hand mixer is a small kitchen device used to quickly mix wet and dry ingredients into a uniform substance. Today, instead of mixing eggs manually with lots of efforts, one can turn the mixer on and save much time. Furthermore, the results will be way better. All hand mixers are easy to clean from food remnants. Beaters and other accessories are easy to remove and attach. Almost all accessories are dishwasher safe. In addition, wire-beaters don’t have any aluminium intrusion and therefore, they resist rust very well. 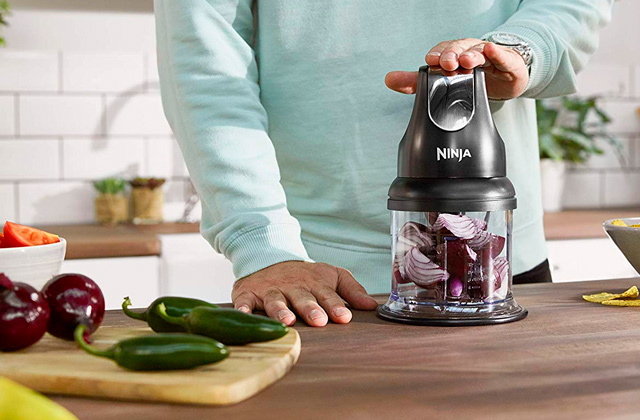 If you need an appliance that'd not only mix food but also chop, cut, and beat it, look towards handheld and countertop blenders listed in our other reviews. Homemakers searching a versatile kitchen gadget designed to perform more tasks beyond basic mixing might find our food processors reviews and guides interesting. Firstly, you need to know that Power of a hand mixer is an important issue. The higher the power is, the faster the mixer will stir the ingredients. To begin with, you should decide on a purpose the mixer will be used for. If you are planning to stir and beat butter, cream, soft drinks or food - 100-150 Watts is quite a suitable power. But if you need to mix up the dough and similar products, it's much better to pick more powerful mixers, with a power about 200-250 Watts. Hand mixers include different additional Attachments. Thanks to these accessories, you will be able to cook various dishes only with the help of mixer! Usually, wire beaters of a mixer are made from a more durable material than the body of a mixer itself. But if you need just to stir soft ingredients, you can buy any basic electric hand mixer. On the other hand, if you want a multifunctional device in your kitchen, consider buying a mixer with lots of accessories in a package. Number of Speeds is another essential feature. It is important to know that most hand mixers have 3-5 speeds, but some models offer more - over 12. A large number of speeds allows users to mix any ingredients, even the densest bits, with minimum effort. The gear change is one of the most important technical specification, usually controlled by a step switcher. Several models have a “Pulse” button. With its help, the ingredients will be mixed with a different speed for the best result. A variety of speed settings will also let you avoid splattering the ingredients. We'd also like to draw your attention to Construction and Design of handheld mixers. The body of this kitchen appliances is usually made of plastic but with metal elements. This surely enhances the durability of a mixer. Compact mixers will become a great solution for owners of small kitchens. They don't take a lot of space and easily fit any cupboard. 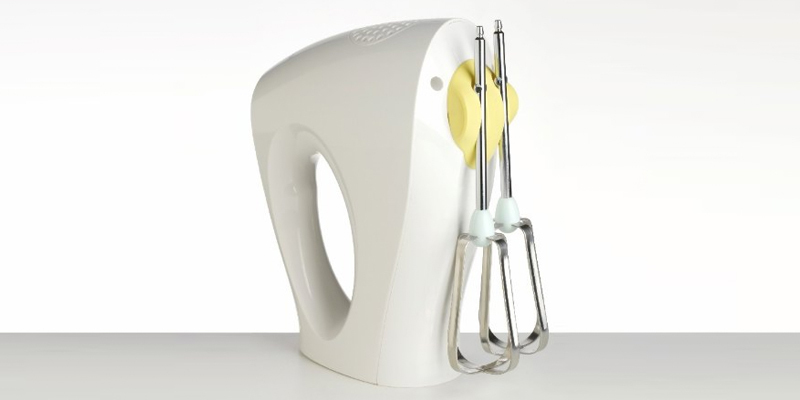 An ergonomic design allows you to use a hand mixer for a long time without any difficulties. Some models offer a comfy storage for a swivel cord right in the unit. Q: Why not to buy a stand mixer instead of a hand one? A: If you are on a budget, a hand mixer is more suitable since it costs less. Plus, it doesn’t take valuable space in your kitchen like a stand mixer. Being a portable device, you will be able to take it with you wherever you want. As for the performance, a hand mixer is fine if you cook for small parties or just for your family and friends. However, if you host bigger events, you should think over a purchase of a stand mixer. Q: Is a hand mixer the same as a blender? 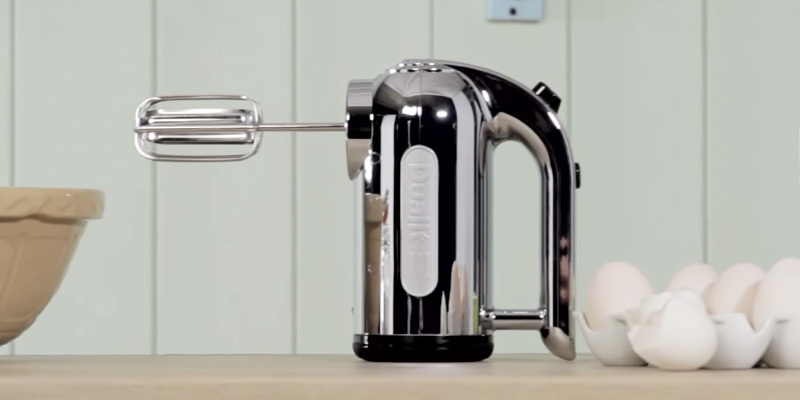 A: A hand mixer combines ingredients, whereas a blender liquefies them. If you want to make some juice, milkshake, or a sauce, use a hand blender rather than a hand mixer. But for kneading dough or other baking processes pick the mixer. 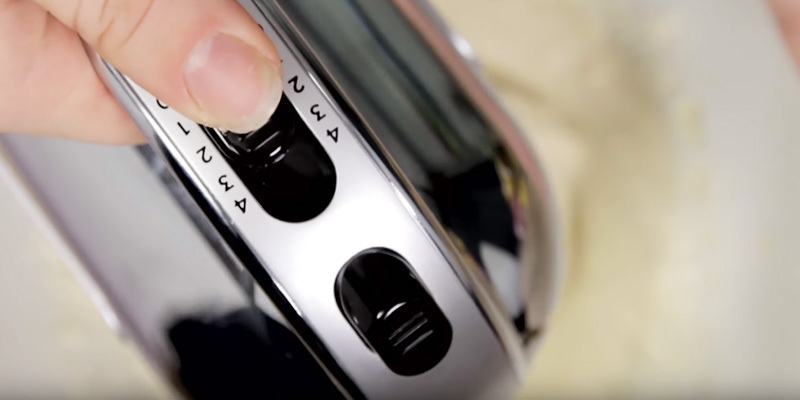 Q: How many speed levels should a hand mixer have? A: It is preferable to have a model with a good range of speed settings to fit each task. Moreover, you will have better control over your mixer. For example, if you need to mix or fold ingredients use low speeds, but if your plan is to whip cream with egg whites to add more air to the ingredients choose high speeds. As a rule, a mixer with 5 to 9 speed settings will be enough. Q: Do all hand mixers come with bowls for mixing? A: No, not all of them. But most hand mixers are designed to fit all types of bowls or other containers you may use when baking. Q: Is it difficult to clean a hand mixer? A: Usually, all attachments are easy to release and clean separately from the main body. You can put them in a dishwasher or run under warm water with a dishwashing liquid. As for the body, just clean it with a damp sponge. Q: What should a good hand mixer handle be like? A: For greater comfort choose hand mixers with ergonomically designed handles to perfectly fit in your hands. The one more important factor is a non-slip grip since it provides a better control when holding a mixer.